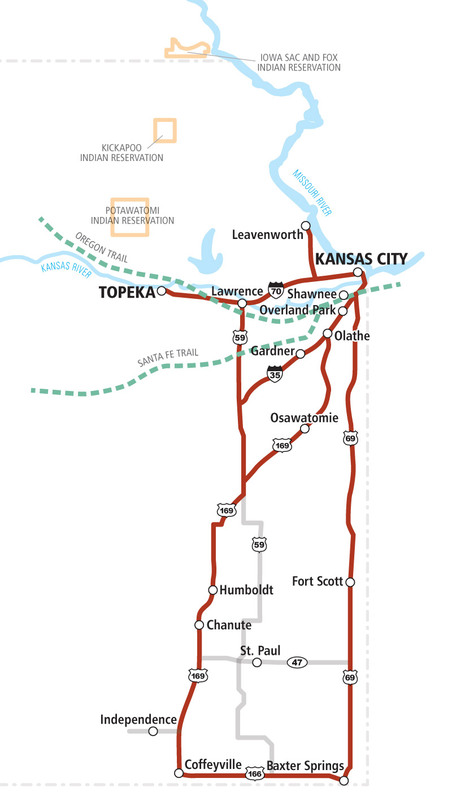 and Kansas, follow the Lewis and Clark Auto Tours. 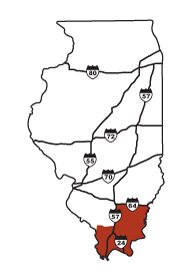 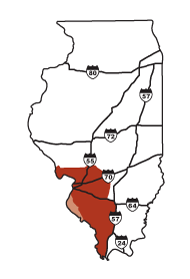 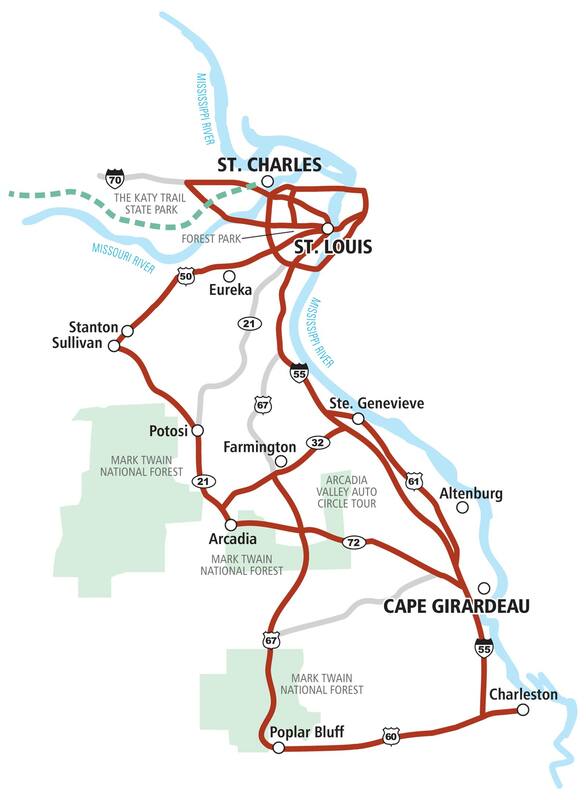 This self-guided auto tour includes Hartford, the Lewis & Clark Confluence Tower, Lewis and Clark State Historic Site, Wood River and a re-created Fort River Dubois, Alton, the Meeting of the Great Rivers Scenic Byway and the Great Rivers Museum and Vandalia with its historic Vandalia Statehouse State Historical Site. 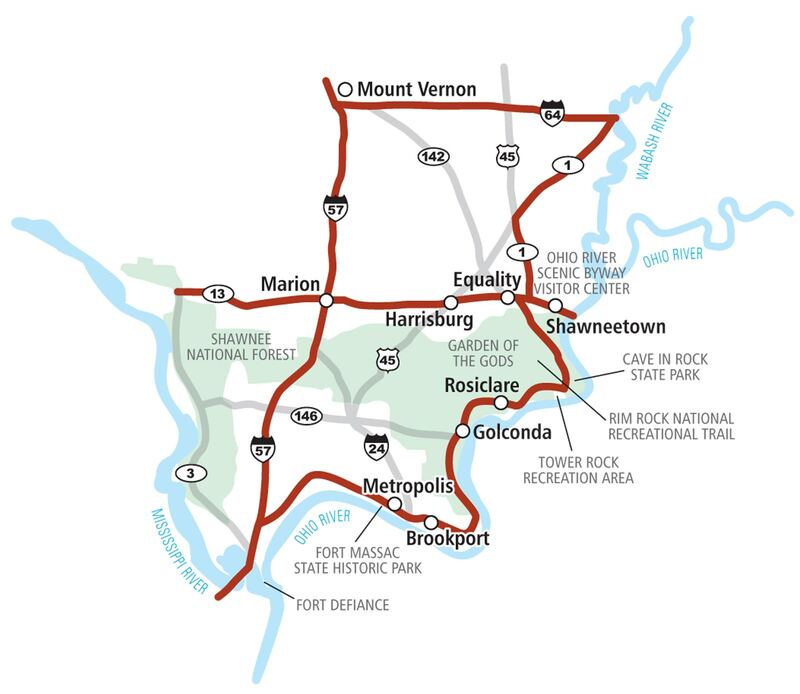 This self-guided auto tour includes the Ohio River Scenic Byway, Garden of the Gods, Shawnee National Forest, Rim Rock National Recreational Trail, Cave in Rock, Fort Massac State Historic Park, and Metropolis with its world-famous Super Museum. 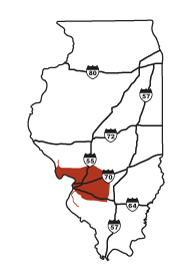 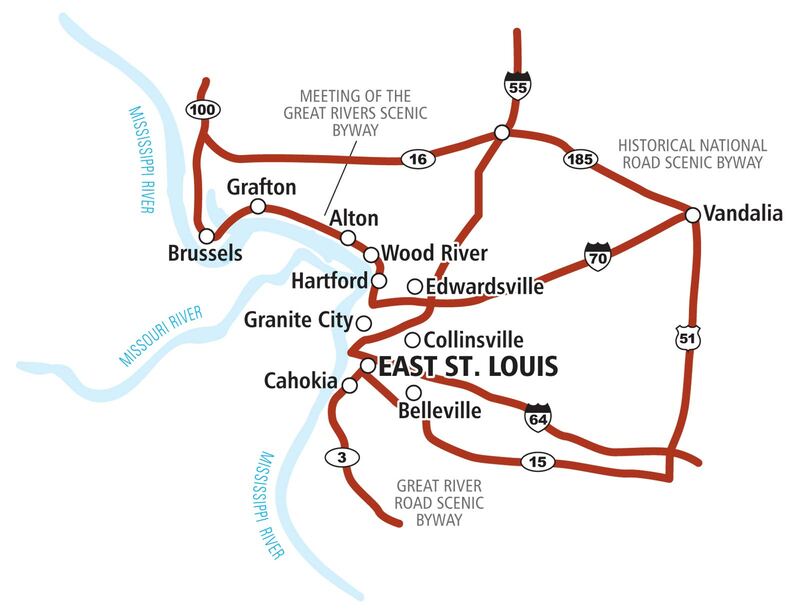 This self-guided auto tour includes Fort Kaskaskia, Carbondale/Murphysboro, Fort de Chartres State Historic Site, Cahokia, Hartford, the Lewis & Clark Confluence Tower, Lewis and Clark State Historic Site, Wood River and a re-created Fort River Dubois, Alton, the Meeting of the Great Rivers Scenic Byway and the Great Rivers Museum, and Grafton at Pere Marquette State Park and Visitors Center. 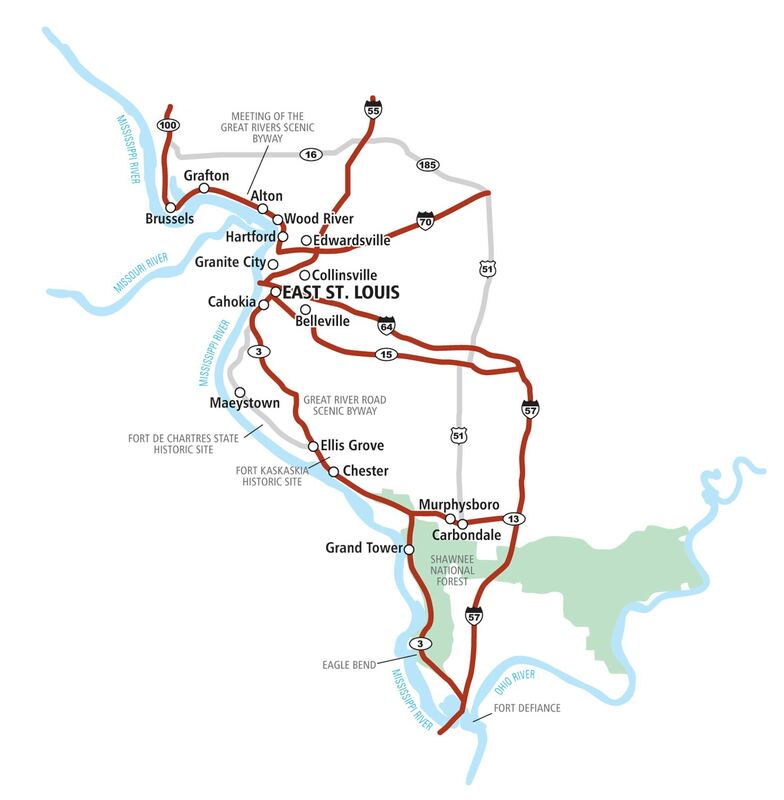 This self-guided auto tour includes St. Louis with its Gateway Arch, Old Courthouse and Laclede’s Landing, historic St. Charles with great shopping and the Lewis and Clark Boathouse and Nature Center, Katy Trail State Park, Washington and the Fort Charrette Village and Museum, Jefferson City with historic Jefferson Landing, Columbia with Bluestem Missouri Crafts’ boutiques. 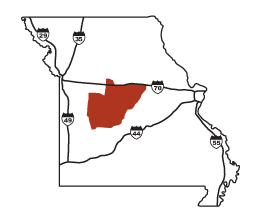 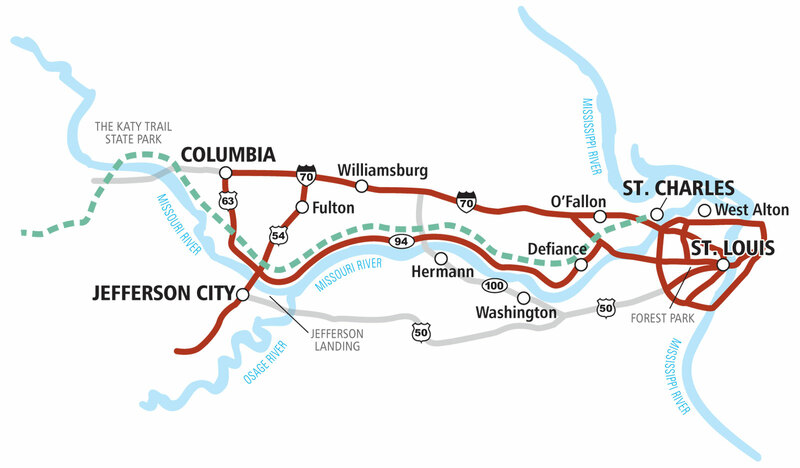 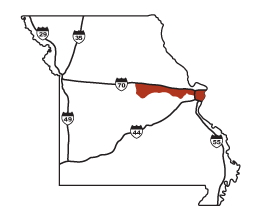 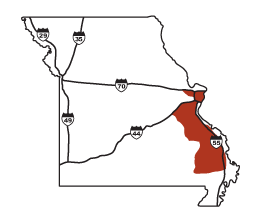 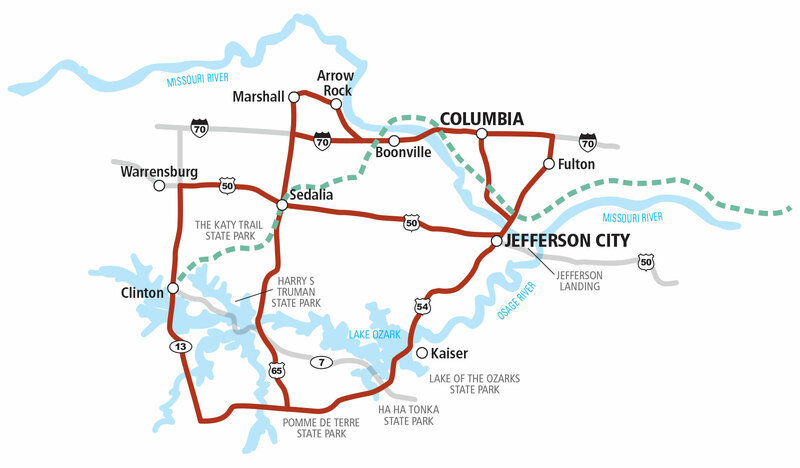 This self-guided auto tour includes Jefferson City and the historic Missouri State Capitol, Columbia and the State Historical Art Galleries with the work of Thomas Hart Benton, Boonville and the Boonville Village Center and River, Rails and Trails Museum, Arrow Rock, Sedalia, Ha Ha Tonka State park, and Lake of the Ozarks State Park. 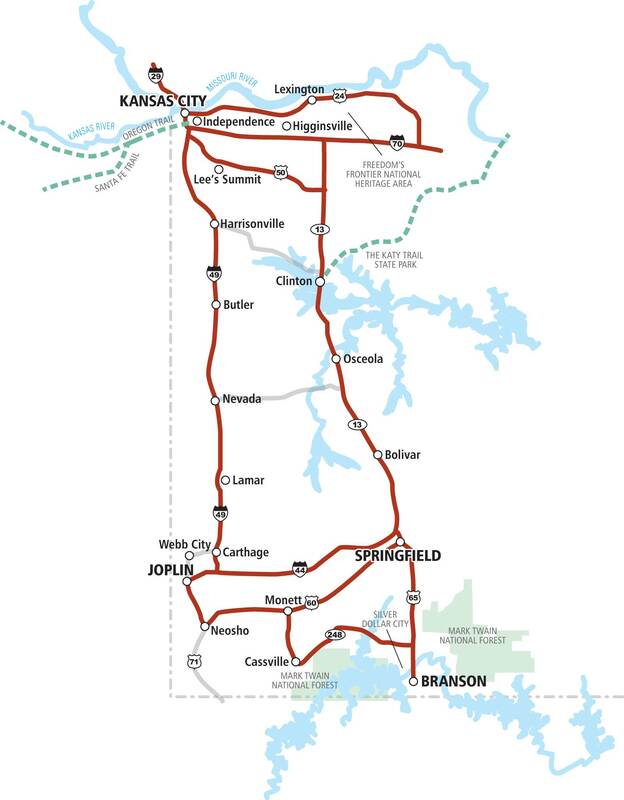 This self-guided auto tour includes Kansas City Missouri and Country Club Plaza, the Nelson-Atkins Museum of Art, National World War I Museum, Freedom’s Frontier National Heritage Area museums and Civil War battlefields, Joplin, Branson and Mark Twain National Forest and Independence with the Harry National Trails Museum. 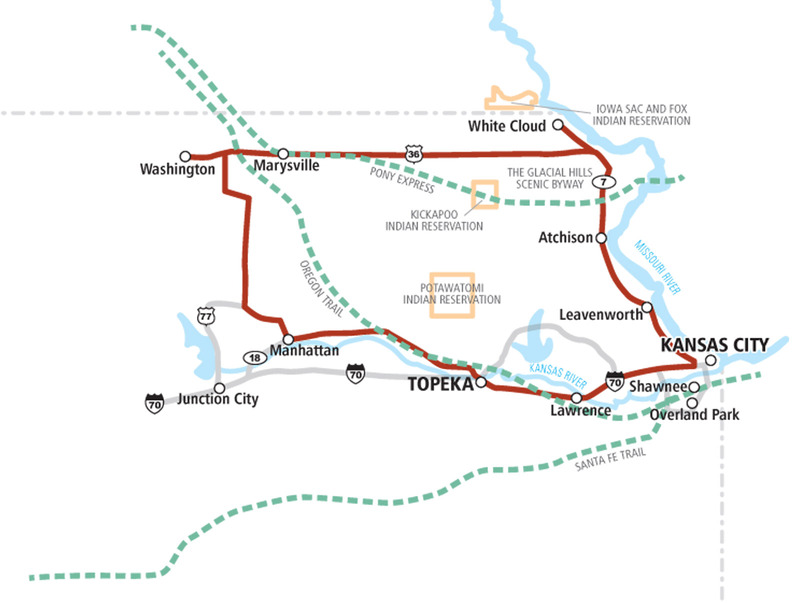 This self-guided auto tour includes Kansas City Kansas and Schlitterbahn Waterpark Kansas City, Kansas Speedway and the Village West Shopping area, Leavenworth with the Frontier Army Museum and historic Ft. Leavenworth, Atchison with Lewis and Clark Riverfront Pavilion and the Atchison County Historical Museum and Santa Fe Depot, Manhattan and the Flint Hills Discovery Center and Konza Prairie Biological Station, Topeka, Lawrence and Overland Park with the Deanna Rose Children’s farmstead and the Museum at Prairiefire. 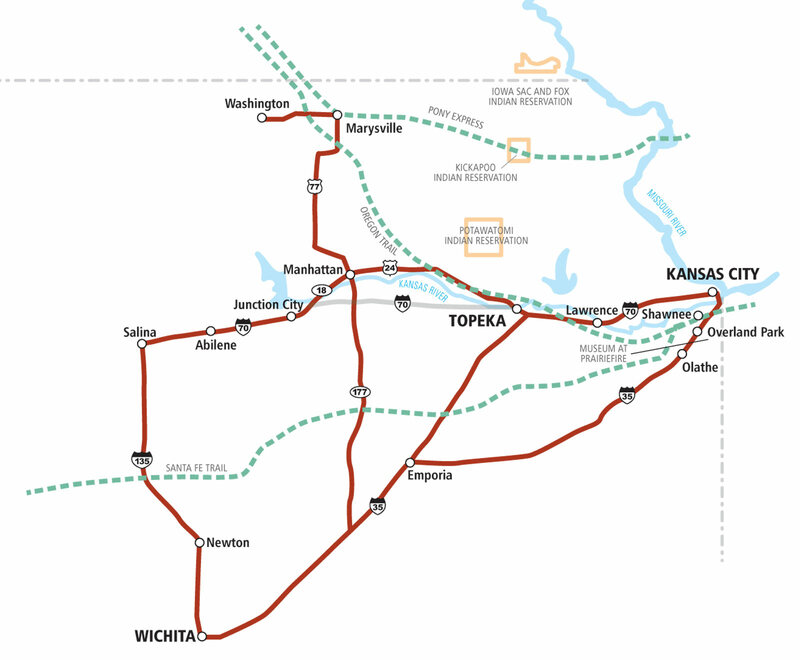 This self-guided auto tour includes Kansas City Kansas and Schlitterbahn Waterpark Kansas City, Cabela’s and Legends Outlets Kansas City, Olathe with the Mahaffie Stagecoach Stop and Farm Historic Site, Topeka with the historic Kansas Capitol, Manhattan with the Flint Hills Discovery Center, Abilene and the Dwight D. Eisenhower Presidential Library, Salina and the Rolling Hills Zoo and Wichita. 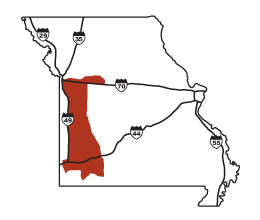 This self-guided auto tour includes Kansas City Kansas, Freedom’s Frontier National Heritage Area, Leavenworth with historic Fort Leavenworth, Topeka and Old Prairie Town, Lawrence, Overland Park and the Deanna Rose Children’s Farmstead, Olathe and the Mahaffie Stagecoach Stop and Farm Historic Site.